Happy National Aboriginal Day! I can’t wait to meet some of you out around the sunrise ceremony and community breakfast tomorrow morning, and a full day of gathering and celebration around my home community, St. George’s. I’m thankful to my own community leaders, and all the volunteers across the province who plan such nice days for us all to enjoy. Wela’lin! Want to know what’s happening near you tomorrow for Aboriginal Day, and all summer long? Please check our events calendar at www.qalipu.ca/events. Personally, I’m looking forward to cooking around the fire with gourmet chefs who will show visitors how to use simple, traditional ingredients to make something beautiful. This event takes place in Cow Head on June 28, 7:00 PM. In this edition of Maw-pemita’jik Qalipu’k we share successes of quite a few outstanding individuals. Elder Calvin White, Cst. Shawna Park, Paula Hall, Michael Brake, and Judy White. Each of these proud Mi’kmaq have much to offer to their communities. Find their stories inside. 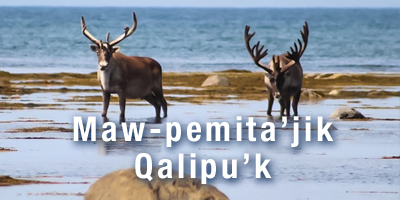 Find a few of Qalipu’s news updates including a message from the Chief, an update on the Outdoor Education Program, World Ocean’s Day success and all the information you need to know about the RNC Junior Police Academy as a youth participant or as a volunteer chaperone. Please read on, and stay in touch.